Don't lie … you've watched the Pokémon cartoon at some point in your life. It's okay, it'll be our little secret. The Pokémon cartoon is using a cartoon as a product promotional tool at its best, and considering how many years it has been running now, it obviously works. It has inspired fan fiction – stories created by fans that branch off from the source material – of all kinds, but sometime that work rises to such a level that you just have to say, "I really would rather this be the real thing!" 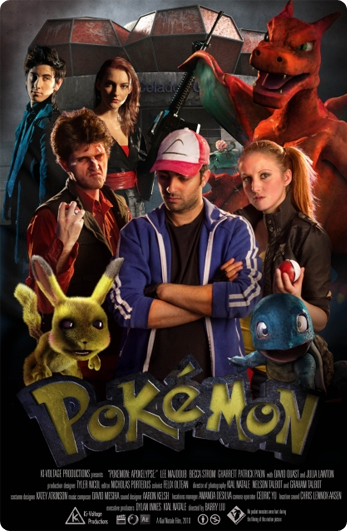 Case in point has to be the Pokémon Apokélypse trailer you see in this post. Sure some of the CGI work isn't up to Hollywood standards, but how can you fault people that sit around make this sort of thing for free and share it with the entire Internet? You really can't. And this is certainly about a thousand times better than I could ever do. Alright, really it would be more like a million times better than what I could do. Honestly, when you think about the premise of Pokémon, you do start to realize these people really are no better than people staging rooster fights in a barn. "Oh, hey Pikachu, I love you! … now get in the ring and put your life at risk for really no good reason!" So, yes, the series could do with a "dark" re-imagining, and this is what I would hope it would look like. While some dark reboots have failed (Superman Returns, Hulk), others have been super successful (Batman Begins). While this wouldn't actually garner enough revenue at the box office to be made into an actual movie, it makes a heck of a fun trailer, and I certainly encourage the folks behind it to make more. For the full story you can read an interview with the creators here, and certainly send them some love for all of heir hard work. What say you? Would you like to see a full version of this?